Digitala trender och big data-värden förutspår att årets vinnare av Melodifestivalen blir en favorit från i fjol. Det är de yngre artisterna med störst digital närvaro som får högst siffror. Om man väljer att se på vilken låt som spelas mest på Spotify så vinner Wiktoria. Det har blivit samtidens stora sanning att siffror och kultur hör ihop. I takt med digitaliseringen av samhället går beteenden att mäta, väga och beräkna, och inget kulturevenemang, möjligen jämte Nobelpriset i litteratur, skapar sifferexercis i så hög utsträckning som melodifestivalen. Underlaget blir kort sagt omöjligt att hålla fingrarna borta ifrån: bara förra årets final innebar dryga 12,6 miljoner röster via sms, telefonsamtal och app. Popmuzik träffade Wiktoria på artisthotellet. Johan och Emanuel på Popmuzik träffade henne på artisthotellet för en intervju där vi snackade om året som gått och om hur hon laddat inför Melodifestivalen. Sweden Melodifestivalen 2017: Wiktoria to the final! The fourth and final heat took place tonight in the Swedish Melodifestivalen 2017. Seven songs were performed in Skellefteå Kraft Arena in Skellefteå, and the two winners qualified direct to the final of Melodifestivalen: Wiktoria and Jon Henrik Fjällgren feat. Aninia and two acts for the “second chance”: Loreen and Axel Schylström. The LED projection dress is so 2012. So Sweden’s Wiktoria upped the game and dropped an LED body suit. She stood alone on stage — the visuals and her amazing voice were more than enough to fill the screen and the space. The act opened with a spotlight opening on her oversized belt, which has a W for Wiktoria (not wiwibloggs). LED water exploded on her bosom before enveloping her whole body in ripples — it was like Danny Saucedo’s “Amazing” jump suit but so much better. At times the ever-changing lights made it seem like she was wearing a gown, a pantsuit and even the universe. The LED backdrop was equally bright and dizzying. The camera panned around her and at times she looked bionic, the star of Artificial Intelligence, a Robot Top Model. The LED showed exploding stars and swirling lights. At the end the projection set her on fire but by then her voice already had her smokin’. When the camera zoomed in on her head she looked like some other-worldly angel. God, I love her curls. 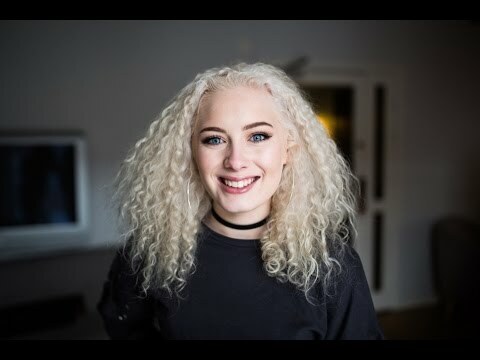 Wiktoria will participate in the Swedish competition for the Eurovision Song Contest, Melodifestivalen. Eurovision Song Contest is the worlds largest music competition and will be broadcast worldwide from Stockholm, Sweden in May in 2016. Wiktoria Johansson is 19 years old and comes from Bramhult in Borås in Sweden. She has participated in several talent contests, band member of Dash4 – The Band and makes debut in Melodifestivalen. The song “Save Me”, she wrote together with Jens Siverstedt, a music producer and rapper from the hip-hop duo Morfeta & Jerre, who also debuts in this context. – It is a complex love story. The girl can just talk to her mother. It makes me happy, but it is emotional, and I think many people can relate to it, says Wiktoria. After a successful summer with a big tour we went into the studio to record new material. We also visited Norway to work with some well-known songwriters. We have signed a label contract with Roxy Recordings and the beginning of this collaboration is new single “Rewind”. “Rewind” is a fast-paced electro pop song written by Jason Gill, David Clewett and Måns Zelmerlöw.